Russian President Vladimir Putin’s press secretary, Dmitry Peskov, confirmed the oil-for-goods deal between Moscow and Tehran is “absolutely” a reality and has begun. Russia has started supplying grain, equipment and construction materials to Iran in exchange for crude oil under the barter deal announced by Russia’s Ministry of Foreign Affairs. "Absolutely! Of course,” Kremlin spokesman Dmitry Peskov said when asked by reporters on Tuesday if the statement the Ministry of Foreign Affairs made on Monday was accurate, and the exchange had indeed started. “Focus on the statement of the Ministry of Foreign Affairs,” Peskov said. On Monday, Russian Deputy Foreign Minister Sergei Ryabkov made the details of the trading partnership public. 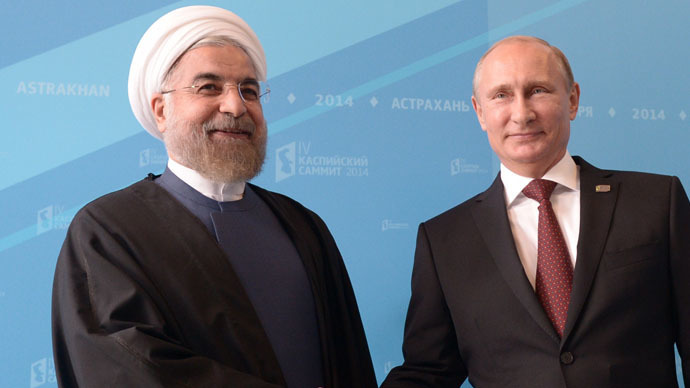 According to Energy Minister Alexander Novak, Russia hasn’t yet received any Iranian oil. Much of Iran’s oil reserves – the world’s fourth largest - remain untapped. Western sanctions put the brakes on discovery and exploration in the oil and gas industries. Moscow may buy up to 500,000 barrels of Iranian oil per day, which would help Iran bring the 20-30 million barrels of crude oil they have in storage to market. Iran, the third largest Russian grain customer, will ship wheat into the country. Russian state-run power utility Inter RAO and Inter RAO Export, as well as Technopromexport would supply equipment and help construct power stations in Iran, Russian Energy Minister Aleksandr Novak said previously. On Monday, Russian President Vladimir Putin announced that Russia is lifting the ban on the delivery of S-300 missile rocket systems to Iran. The Kremlin canceled a 2010 self-imposed ban, suggested by the US and allies, not to sell Iran the artillery. In April, Iran reached a nuclear agreement with the P5+1 countries to prevent Tehran from developing nuclear arms as long as the West lifted sanctions, which have been in place for nearly 40 years. By June 2015, a final agreement is expected to be reached, which will lift sanctions, including the oil embargo against Iran. After sanctions are loosened, Iran’s oil minister thinks the country can increase shipments by one million barrels a day.